The box and contents pictured here are what all of our brand new Chris Reeve Knives are delivered in via UPS. We will send you a UPS Tracking Number when your purchase ships. There is no difference between buying a CRK knife direct from the factory or from an Authorized CRK Dealer such as us. Picture is for graphical representation only. 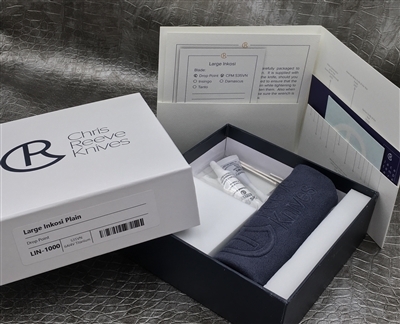 All of our Chris Reeve Knives ship in their original (and unopened) box along with product card, small tube of fluorinated grease and registration card exactly as if it came direct from CRK.